MORR Wheels unveils its awesome American BMW. 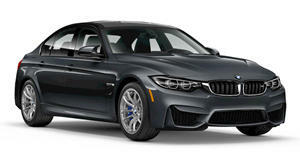 As the first 2015 BMW M3 to be delivered in the United States, this unit has become the "test bed for an array of different manufacturers." Seen here after its tuning and aftermarket work, the car has been fitted with 20-inch MORR MonoForged VS52 Competition wheels. Moreover, it has been given a "Beta Tune" that pushes the six-cylinder, 3.0-liter engine to 580 horsepower and 625 lb-ft of torque. The Bimmer has also been given a new set of brakes. The Brembo Big Brake Kate includes 380 mm front and rear slotted rotors with yellow calipers. Further stock upgrades include the Executive Package, Driver Assistance, Lighting Package, and an M-DCT transmission.